As mentioned in my last post, I wanted more petticoats for my 1780s dress. I know from ladies in more regional dress in the 18th century (which followed fashion quite closely), that they probably wore at least 4 petticoats 1. As I can’t really imagine fashionable ladies wearing fewer, I’d ideally have 4 for my ensemble as well. One plain linen bottom one, underneath the false rump. One simple linen one as first one over the rump, one striped linen or wool one over the rump, and a final, prettier, printed cotton one as top ‘under’ petticoat. The top petticoat was usually the prettiest, as that one might show when lifting up the skirt. When writing the last post, I had one grey linen petticoat, which I’ll be wearing right on top of the rump. Now, I’ve also added the final, printed cotton petticoat to the list! It’s made the same way as my grey linen petticoat, following this tutorial. Basically, you take a two big rectangles and sew them together on the sides leaving open a slit at the top. You then fold down the top so the hem will even out over a rump (longer in the back), and them the bottom. Then the top is pleated so each side is a little larger than the waist measurement, and you add a waistband and ties. Very simple, and nice for a quick side project, especially if you cheat and sew it by machine as I did. My petticoat is made of cotton, printed with red flowers. If it looks familiar, that might be right, as it’s made from one of the new Ikea duvets. In the costuming community, Ikea is known for some fabrics which are based on 18th century textiles. As such, they’re actually reasonably historically accurate, though sometimes colors are slightly off, and not all of them are equally good. Plus side is also that they’re very easy to get a hold of, and often relatively cheap! This particular line is new, and is a two-color design. The flowers are quite small, and there’s a fair bit of white space which makes it most suitable for later 18th century styles. The color way is what makes this a little bit unusual as a chintz reproduction. By far most chintz is multi-colored. Two-tone designs are quite a bit rarer. If there are two colors, it’s either white-black, black-white, white-blue, or white red. The white-black and blue-white combinations were often worn for mourning, especially in regional costume. The red-white chintz is often called ‘milk and blood’ in Dutch. You see it most often in the costume of Hindeloopen, where it was used specifically for bridal clothing. Bridal Wentke from Hindeloopen. Zuiderzeemuseum. Although a bit rarer, you do see ‘fashionable’ dress in white and red as well. This jacket is a very nice example. All in all, the fabric is pretty close to historical, and a nice choice for a petticoat which might show on occasion! Fries museum. Petticoat with red flowers. 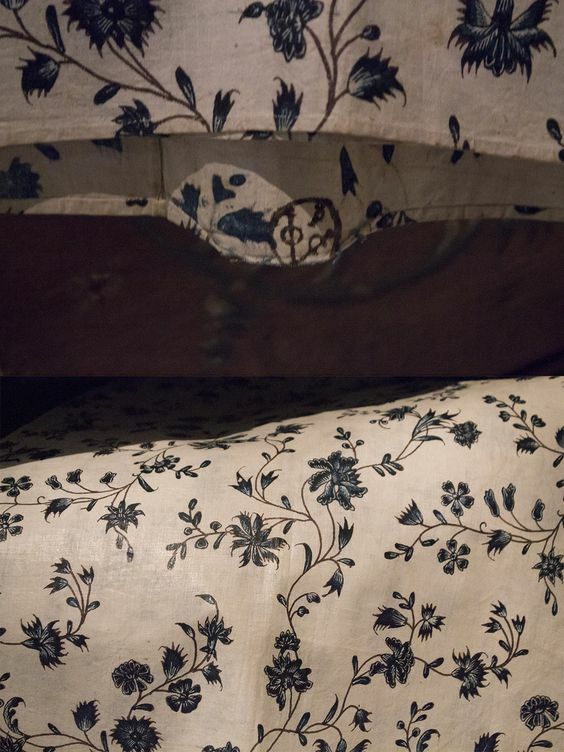 Chintz from the Fries museum, looking quite similar to the little Ikea flowers! Thanks for the advice about Ikea–I had not known it. The petticoat looks good. 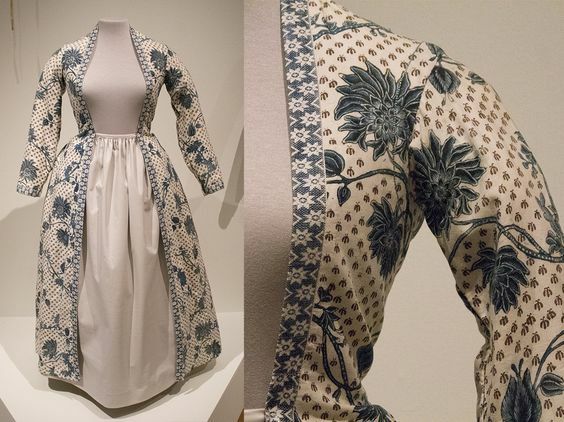 A really nice petticoat, and thank you for sharing the dressing sequence and period chintz examples too – very interesting!